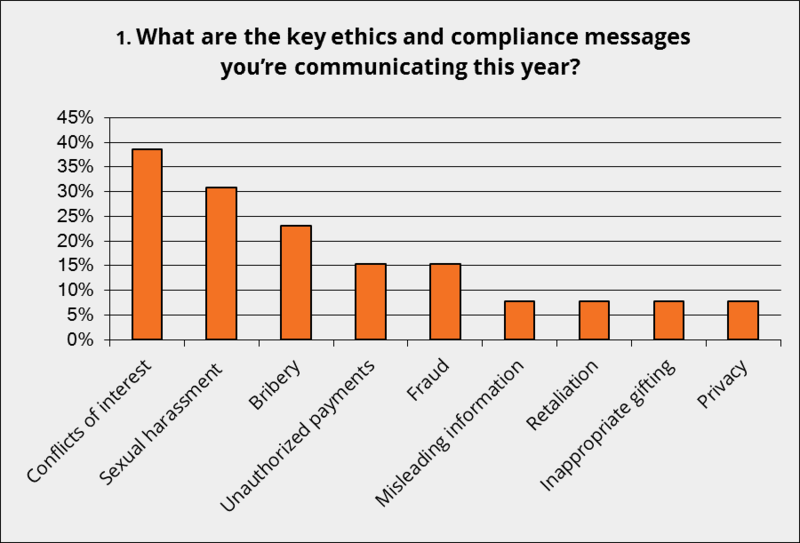 Conflicts of interest and sexual harassment are the priority themes that Ethics and Compliance officers will be communicating in the coming months, according to our survey at SCCE’s Compliance & Ethics conference in Chicago last week (September 2016). “In the past 12 months, we’ve experienced a threefold increase in enquiries from organizations looking for better ways to communicate these and other ethics-related topics. But this movement is not without its obstacles. According to SnapComms survey respondents, a key challenge remains how to genuinely get employee attention in today’s information overloaded world. SnapComms also asked delegates which teams (or functional areas) are the most difficult to communicate with. 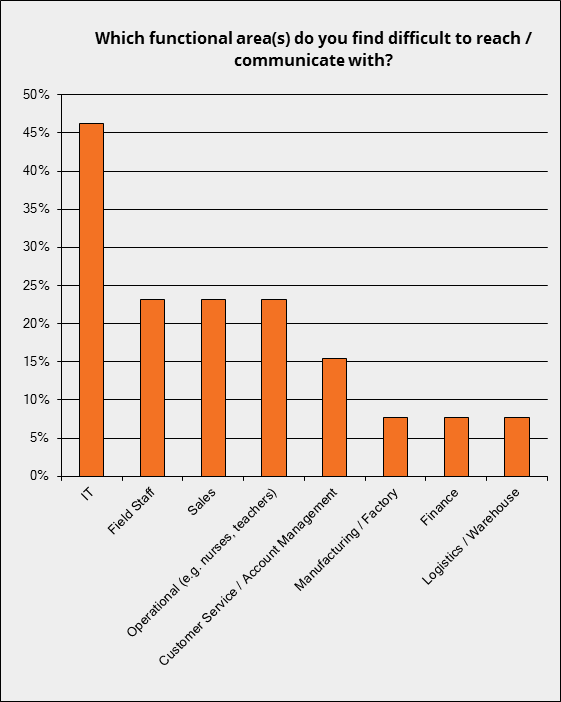 IT teams topped the list with 47% respondents citing this team as the most difficult to communicate with. Sarah Perry suggests this may be because IT often works shift patterns and during office downtime periods in order to complete essential IT maintenance and upgrades. Based on responses to SnapComms’ survey ‘Ethics & Compliance 2016’, SCCE Ethics and Compliance conference, Chicago, September 2016. Responses ranged from ‘Getting beyond checking the box’; ‘Tracking and verifying training’, and ‘Changing company culture’. To help solve these headaches, and also connect with hard-to-reach groups, Sarah Perry offers this: “A proven method to drive behavioral change across diverse teams is through short-burst, drip-style campaigns. “If you want your comms to have any effect, it’s time to move beyond email,” Sarah Perry concludes. *The National Business Ethics Survey reported an increase in organizations providing ethics trainings, from 74 per cent to 81 per cent in three years. Do you face similar challenges to those shared with SnapComms at SCCE 2016? 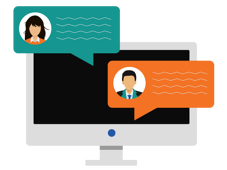 What are your priority topics to communicate for the year ahead? Any communication tips to help your peers? Feel free to leave a reply below.